Barnes, J. D., Penniston-Dorland, S. C., Bebout, G. E., Hoover, W., Beaudoin, G. M., and Agard, P., 2019, Chlorine and lithium behavior in metasedimentary rocks during prograde metamorphism: A comparative study of exhumed subduction complexes (Catalina Schist and Schistes Lustres), Lithos. House, B. M., Bebout, G. E., and Hilton, D. R., 2019, Carbon cycling at the Sunda margin, Indonesia: A regional study with global implications, Geology. Nakamura, E., Kunihiro, T., Ota, T., Sakaguchi, C., Tanaka, R., Kitagawa, H., Kobayashi, K., Yamanaka, M., Shimaki, Y., Bebout, G. E., Miura, H., Yamamoto, T., Malkovets, V., Grokhovsky, V., Koroleva, O., and Litasov, K., 2019, Hypervelocity collision and water-rock interaction in space preserved in the Chelyabinsk ordinary chondrite, Proceedings of the Japan Academy. Jaeckel, K., Bebout, G. E., and Angiboust, S., 2018, Deformation-enhanced fluid and mass transfer along Western and Central Alps paleo-subduction interfaces: Significance for carbon cycling models, Geosphere, v. 14, doi.org/10.1130/GES01587.1. Anderson, L. D., Bebout, G. E., Izawa, M. R. M., Bridge, N. J., and Banerjee, N. R., 2017, Chemical alteration and preservation of sedimentary/organic nitrogen isotopic signatures in a 2.7 Ga seafloor volcanic sequence, International Journal of Astrobiology, doi.org/10.1017/S1473550417000441. Bebout, G. E., Banerjee, N. R., Izawa, M. R. M., Kobayashi, K., Lazzeri, K., Ranieri, L., and Nakamura, E., 2017, Nitrogen concentrations and isotopic compositions of seafloor-altered terrestrial basaltic glass: Implications for astrobiology, Astrobiology, v. 18, no. 4, DOI: 10.1089/ast.2017.1708. 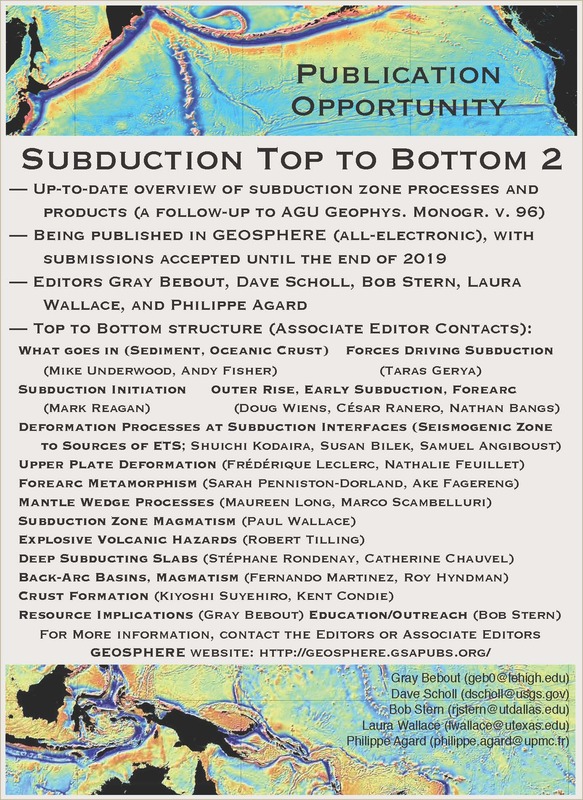 Bebout, G. E., Scholl, D. W., Stern, R. J., Wallace, L. M., and Agard, P., 2017, Twenty years of subduction zone science: Subduction Top to Bottom 2 (ST2B-2), GSA Today, v. 28, doi: 10.1130/GSATG354A.1. Angiboust, S., Yamato, P., Hertgen, S., Hyppolito, T., Bebout, G. E., and Morales, L., 2016, Fluid pathways and high pressure metasomatism in a subducted continental slice (Mt. Emilius klippe, W. Alps), Journal of Metamorphic Geology, DOI: 10.1111/jmg.12241. Lazzeri, K. E., Bebout, G. E., and Geiger, C.A., 2016, Nitrogen and carbon concentrations and isotopic compositions of the silica clathrate melanophlogite, American Mineralogist, http://dx.doi.org/10.2138/am-2016-5876. Sievers, N. E., Tenore, J., Bebout, G. E., and Penniston-Dorland, S. C., 2016, Fingerprints of forearc element mobility in blueschist-facies metaconglomerates, Catalina Schist, California, International Geology Reviews. Halama, R., Bebout, G. E., John, T., and Marschall, H., 2016, Fluid-induced breakdown of white mica controls nitrogen transfer during fluid-rock interaction in subduction zones, International Geology Reviews. Bebout, G. E., 2016, Caesium: Element and Geochemistry, invited chapter for Encyclopedia of Geochemistry, Earth Science Series, Springer. Scambelluri, M., Bebout, G. E., Belmonte, D., Gilio, M., Campomenosi, N., Collins, N. C., and Crispini, L., 2016, Carbonation of subduction-zone serpentinite (high-pressure ophicarbonate; Ligurian Western Alps) and implications for the deep carbon cycling. Earth and Planetary Science Letters, doi:10.1016/j.epsl.2016.02.034. Bebout, G. E., and Penniston-Dorland, S. C., 2015, Fluid and mass transfer at subduction interfaces—The field metamorphic record (Invited Review Article), Lithos, DOI: 10.1016/j.lithos.2015.10.007. Collins, N. C., Bebout, G. E., Angiboust, S., Agard, P., Scambelluri, M., Crispini, L., and John, T., 2015, Subduction zone metamorphic pathway for deep carbon cycling: II. Evidence from HP/UHP metabasaltic rocks and ophicarbonates. Chemical Geology, DOI: 10.1016/j.chemgeo.2015.06.012. Bebout, G. E., Lazzeri, K. E., and Geiger, C. A., 2015, Pathways for nitrogen cycling in Earth's crust and upper mantle: A review and new results for microporous beryl and cordierite (Invited Centennial Article), American Mineralogist, DOI: 10.2138/am-2015-5363. Cook-Kollars, J., Bebout, G. E., Collins, N. C., Angiboust, S., and Agard, P., 2014, Subduction zone metamorphic pathway for deep carbon cycling: I. Evidence from HP/UHP metasedimentary rocks, Italian Alps, Chemical Geology, DOI: 10.1016/j.chemgeo.2014.07.013. Penniston-Dorland, S., Gorman, J. K., Bebout, G. E., Piccoli, P. M., and Walker, R. J., 2014, Reaction rind formation in the Catalina Schist: Deciphering a history of mechanical mixing and metasomatic alteration, Chemical Geology, DOI: 10.1016/j.chemgeo.2014.06.024. 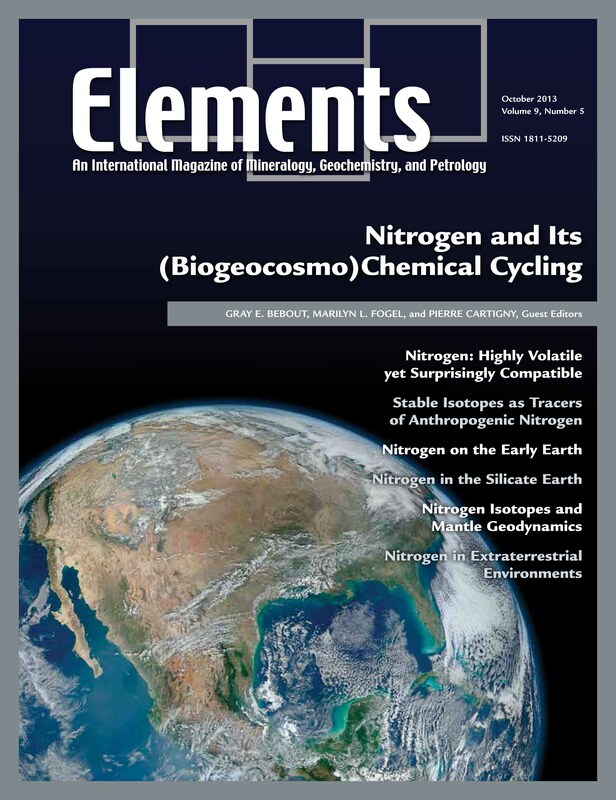 Bebout, G. E., Fogel, M. L., and Cartigny, P., 2013, Nitrogen: Highly volatile yet surprisingly compatible, for special issue of ELEMENTS (Nitrogen and its (BioGeoCosmo)Chemical Cycling, editors Bebout, G. E., Fogel, M. L., and Cartigny, P.), DOI: 10.2113/gselements.9.5.333. Busigny, V., and Bebout, G. E., 2013, Nitrogen in the silicate Earth: Speciation and isotopic behavior during fluid-mineral interactions, for special issue of ELEMENTS (Nitrogen and its (BioGeoCosmo)Chemical Cycling, editors Bebout, G. E., Fogel, M. L., and Cartigny, P.), DOI: 10.2113/gselements.9.5.353. Godfrey, L. V., Poulton, S. M., Bebout G. E., and Fralick, P. W., 2013, Stability of the nitrogen cycle during development of sulfidic water in the redox-stratified late Paleoproterozoic Ocean, Geology, v. 41, 655-658 DOI: 10.1130/G33930.1. Bebout, G. E., Agard, P., Kobayashi, K., Moriguti, T., and Nakamura, E., 2013, Devolatilization and trace element mobility in deeply subducted sedimentary rocks: Evidence from Western Alps HP/UHP suites, Chemical Geology, v. 342, 1-20, DOI: 10.1016/j.chemgeo.2013.01.009. Bebout, G. E., 2013, (Invited) 4.20. Chemical and Isotopic Cycling in Subduction Zones, in Rudnick, R. L., ed., The Crust, Treatise on Geochemistry (eds. H. D. Holland and K. K. Turekian, Second Edition), Elsevier-Pergamon, Oxford., pp. 703-747. Zelanko, P., Yu, Z., Bebout, G. E., and Kauffman, A. J., 2012, Multiple early Holocene climate oscillations at Silver Lake, New Jersey and their possible linkage with outburst floods, Palaeogeography, Palaeoclimatology, Palaeoecology, DOI:10.1016/j.palaeo.2012.06.028. Halama R., Bebout, G. E., John, T., and Scambelluri, M., 2012, Nitrogen recycling in subducted mantle rocks and implications for the global nitrogen cycle, International Journal of Earth Sciences (Geologische Rundschau), DOI: 10.1007/s00531-012-0782-3. John, T., Gussone, N., Podladchikov, Y. Y., Bebout, G. E., Dohmen, R., Halama, R., Klemd, R., Magna, T., and Seitz, H.-M., 2012, Volcanic arcs fed by rapid pulsed fuid flow through subducting slabs, Nature Geoscience, DOI: 10.1038/NGEO1482. Gonyo, A., Yu, Z, and Bebout, G. E., 2012, Late Holocene change in climate and atmospheric circulation inferred from geochemical records at Kepler Lake, south-central Alaska, Journal of Paleolimnology, v. 48, 55-67, DOI: 10.1007/s10933-012-9603-8. Evans, M. A., Bebout, G. E., and Brown, C. H., 2012, Changing fluid conditions during folding: An example from the central Appalachians, Tectonophysics, DOI: 10.1016/j.tecto.2012.03.002. Bebout, G. E., 2012, (Invited) Ch. 9. Metasomatism in subduction zones of oceanic slabs, mantle wedges, and the slab-mantle interface, in D. Harlov, and H. Austrheim, editors, Metasomatism and Metamorphism: The Role of Fluids in Crustal and Upper Mantle Processes, Springer, Lecture Notes in Earth Sciences, ISBN: 978-3-642-28393-2. 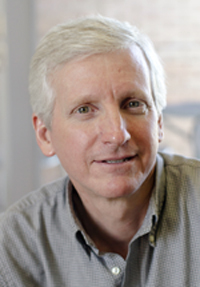 1995 - 1996 Chief Editor "Subduction Top to Bottom", AGU Geophysical Monograph, v. 96 (volume highlighting multidisciplinary study of convergent margins; co-editors Dave Scholl, Steve Kirby, and John Platt). Work is underway on a follow-up to this book, to be published on the twentieth anniversary of GM96.